A ceanothus in full bloom is a wonderful sight… the plants are smothered in flowers which makes them look like beautiful blue clouds and, depending on the variety, the shade can range from delicate light blue through to intense dark blue – nothing can beat them for… well, sheer blue-ness! Although there are some deciduous types, the best are evergreen and flower either through late Spring to early Summer or late Summer to early Autumn, and all are butterfly and bee-friendly – so when you get at least one of these plants (one just won’t be enough! ), you will have to be prepared to share! Our favourite varieties are all evergreen, which means that even when they’re not in gorgeous flower, they still have a valuable role to play in the garden offering, permanent structure and colour, and a great backdrop for plants which flower at a different time – that’s what we call a win-win! 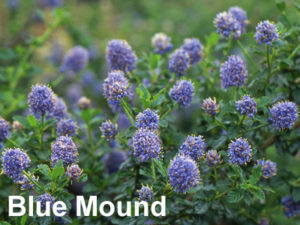 This variety bursts into flower in May and June, when its gorgeous deep blue flowers provide an eye-catching contrast to the pretty, variegated gold and green foliage. Its upright habit makes it ideal as a wall shrub and, although it is hardy, it’s best planted in a sheltered spot so it doesn’t get damaged by frost or wind. 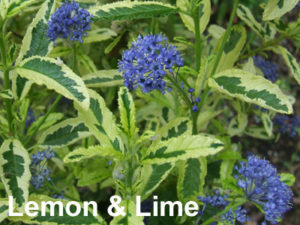 Another variegated variety, the leaves of ceanothus ‘Zanzibar’ are a bright Summer-yellow which are randomly blotched with patches of dark green – the foliage makes a pretty contrast to the wonderful sprays of light blue flowers that appear in May. A smaller, neat, bushy variety which, as the name suggests, forms a dense mound of wavy-edged, glossy dark green leaves which is smothered in bright, deep blue flowers in May and June and, if conditions are favourable, often flowers again in late Summer and Autumn. This handsome, evergreen shrub is our pick of the later flowering varieties – it produces fluffy clusters of sky-blue flowers from August to October which are nicely offset against the glossy, bright green leaves. It has a vigorous upright habit and would be great either for the back of a South or West-facing shrub border, or trained against a sunny wall. 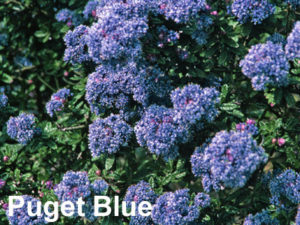 This variety flowers from April to June, when it is covered in dense clusters of stunning dark blue flowers. Its fast-growing, upright nature makes a superb specimen plant for a South or West-facing border, and it needs protection from cold, drying winds which may scorch the deeply veined, dark green leaves. Ideal for a sunny mixed border, this dense, evergreen variety produces stunning wands of tiny, intense dark blue flowers throughout May and June on arching branches of small, glossy, dark green leaves. These plants are native to California, which makes them susceptible to cold. Although they’re generally hardy in our area, to get the very best from them, you’ll need to ensure they have a position in full sun which is protected from strong, cold winds. 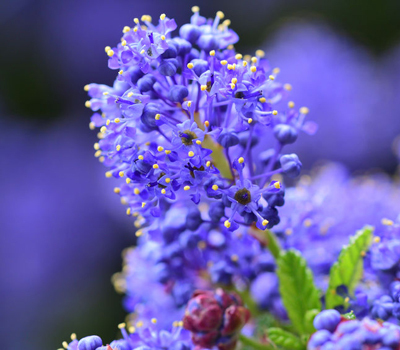 They’re happy in any free-draining soil but do not like chalk or wet clay – but don’t worry if your soil isn’t suitable, you can always provide the conditions your ceanothus needs by growing it in a pot. Pruning is not generally necessary unless you find your plant out-growing its allotted space, and if you do prune, make sure that you don’t cut into old wood as this will not regrow. Generally, evergreen varieties should be pruned after flowering – and to keep your plant looking and flowering at its best, don’t forget to feed and mulch it after pruning. If you’re of a mind to propagate, then semi-ripe cuttings can be taken from August through to October. Simply place 6″ lengths of stem in a half-and-half mixture of soil-based gritty compost and horticultural sand – these should root over Winter (but may take longer) after which they can be potted on individually and planted out in late Spring. Our choice of the best companion plants include those with yellow, daisy-like flowers, tall, dark bearded irises, and yellow rock roses – and if you’re growing your ceanothus against a wall, then repeat-flowering, pink or apricot climbing roses, or clematis, make a stunning combination. 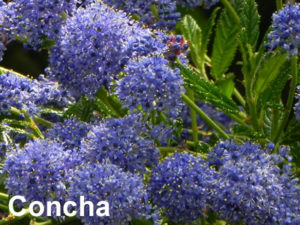 Now you know all you need to know about ceanothus – so stop your California Dreamin’ and get ceanothus planting! Greenhouses & Sheds – Clean, Tidy & Ready for Propagation! Variety is the spice of gardening! Creative plant associations to extend your garden seasons!